Professor Gates arrived at Harvard in 1991 and revitalized the African and African-American Studies program at Harvard. Susan Levenstein '68, who studied Philosophy at Radcliffe College, participated in the 1967 hunger strike. Harvey C. Mansfield Jr. '53, who has worked at Harvard for over 50 years, poses outside of his home. Christina Schlesinger '68 studied English and Fine Arts at Radcliffe College. Linda J. Greenhouse '68 studied government at Radcliffe College. 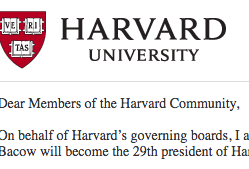 Marlyn E. McGrath '70 is the Director of Admissions for Harvard College. The Harvard Republican Club is pictured in the 1992-3 Harvard Yearbook. Students protest in front of Massachusetts Hall in 1975. A photo from a 1975 yearbook compilation on black community life.